Convergence Academies, now in its second year, is part of Columbia College’s Centers for Community Arts Partnerships, and brings working artists into two Chicago Public Schools: Tilden Career Community Academy High School and Donald L. Morrill Math & Science School, both on the city’s south side. InterArts alums N. Eden Unluata and Kristina Gosh are part of a group of Digital Media Mentors that work with teachers at both schools to integrate digital making techniques into the classrooms. Thesis year students Adrienne Ciskey and Janelle Dowell act as Digital Ateliers working in “maker spaces” in the libraries of both schools. This program is an exciting opportunity to bring the “maker” culture outside of the hack-spaces and college classrooms and into children’s homes. 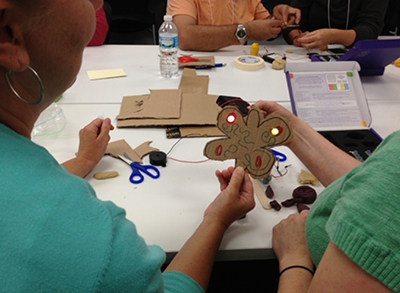 Students will be using things like Squishy Circuits, Little Bits, Scratch, and MaKey MaKeys, incorporating these technologies into their classrooms – and not just the science classes! More about Convergence Academies can be found at http://convergenceacademies.org/.